After a successful opening event at Monza earlier this month, the new International GT Open series heads to Magny-Cours next weekend – to support the WTCC again. We were confused over classes at Monza, but there’s a change for Magny-Cours, which will see GTS cars in their own class – these are FIA GT3 vehicles (somewhat confusingly). 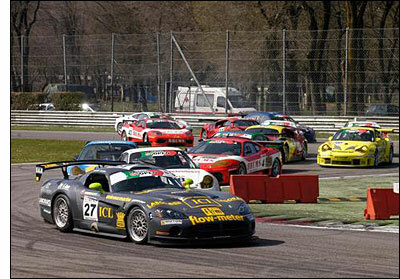 “In Monza, GTS were included as a class in the GTB category but given the success these vehicles seem to enjoy among participants, the International GT Open has decided to welcome them in a category of their own, alongside the traditional GTA (FIA GT2 and National GT2 vehicles) and GTB (Previous FIA GT3 and GT trophies vehicles) categories”, says the official statement. Over 30 cars are confirmed for Magny-Cours, including all those present at Monza, but additions include Noël Del Bello’s (Le Mans) Porsche GT3-RSR, BMS Scuderia Italia will most certainly bring a second Aston Martin DBRS9, and a second Mosler MT900R is entered by Motor Competición for Spanish pair Luis Villalba and Francesc Gutiérrez. RSV Motorsport is expected to bring its brand new F430 GTC. Both one hour races will be broadcast live on Eurosport 2. We've picked out some of the better-known names in the entry list, in bold.